"A Little More Mascara" "With You on My Arm" "La Cage aux Folles" "I Am What I Am" "Maculinity" "The Best of Times"
The musical adaptation of the hit foreign film had a number of false starts. Eventually, songwriter Jerry Herman was offered the project. His new collaborators included director Arthur Laurents and playwright Harvey Fierstein, who had won two Tonys for writing and starring in “Torch Song Trilogy,” a relentlessly honest saga about gay life in New York. 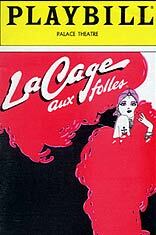 The musical of “La Cage aux Folles” was conceived as a standard romantic musical comedy of a pair of mismatched lovers who, after leaping over the requisite obstacles, discover how deep their love really is; the plot would not have been out of place in a 1920s musical comedy. But here the lovers — Georges, the owner of a St. Tropez drag queen nightclub, and Albin, his star attraction — were a middle-aged homosexual couple. Herman supplied a bouncy score, the production was beautifully cast in the pastel hues of the Cote d’Azur, and the chorus line of drag queens was terrifically entertaining, but the creators wondered what kind of show they really had. The answer was: a hit. The musical, which brought its final curtain down on two men embracing each other and dancing into the sunset, was in turn embraced by audiences of every kind. It went on to run 1,761 performances and will be revived on Broadway in the fall of 2004.